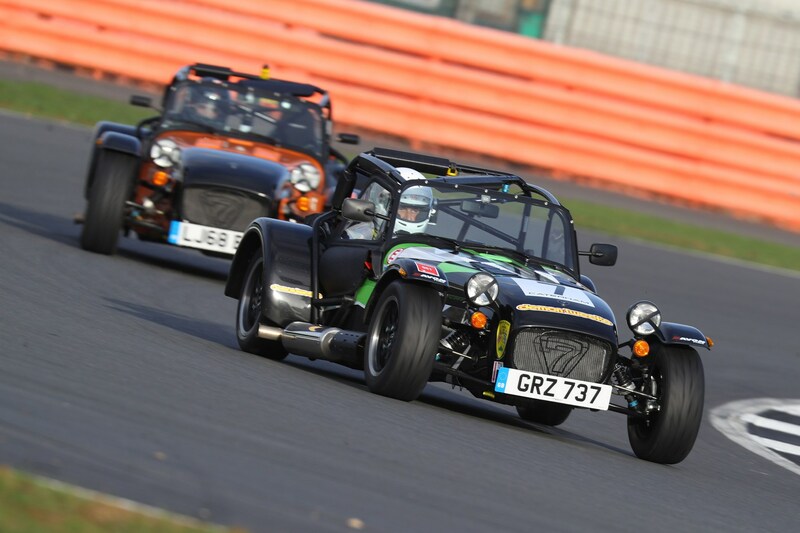 In a 125bhp Roadsport-specification Caterham, the Woodcote corner at Silverstone isn’t remotely difficult: steer right a bit and try to shift from fourth to fifth before you blunder into the rev limiter. That done, wriggle in your seat to get comfortable again, remember to breathe, maybe glance right to see if your pit-board is out. Done. But mid-afternoon on a Saturday in March and Woodcote is suddenly treacherous. On an unusually tight entry line, to leave room for a faster 310R Caterham (more power, wider track and more speed thanks to a titchy aero screen in place of the Roadsport’s barn-door windscreen) to pass around the outside, the persistent drizzle of the last hour has finally intensified to the point of soaking the tarmac. Now, with more steering lock on than normal and a nice layer of water between the rubber on the racetrack and the rubber on my wheels, full throttle is suddenly too much. Revs flare and the featherweight Caterham slews sideways enough to scare both the 310R driver alongside and the poor souls on the pitwall I’m now facing. After far too long my poor brain kicks in. I flail at the Caterham’s bagel-sized steering wheel and play with the tiny, hair-trigger throttle pedal until we’re pointing back up the track. This, I remember, is the good stuff. The stuff that takes you from sickening pre-race nerves to giddy highs: highs that make you talk too quickly and hug rivals like you’re in Top Gun. The stuff that empties bank accounts as efficiently as it demands new loans. The stuff that defines weekends, months, years even. The stuff that makes you new friends when you thought you were too old for that nonsense, and that breeds a camaraderie like nothing else. Racing. It’s special. And with Caterham, it’s easier than you might think to get on the grid. I know what you’re thinking: piles of paperwork, huge expense. 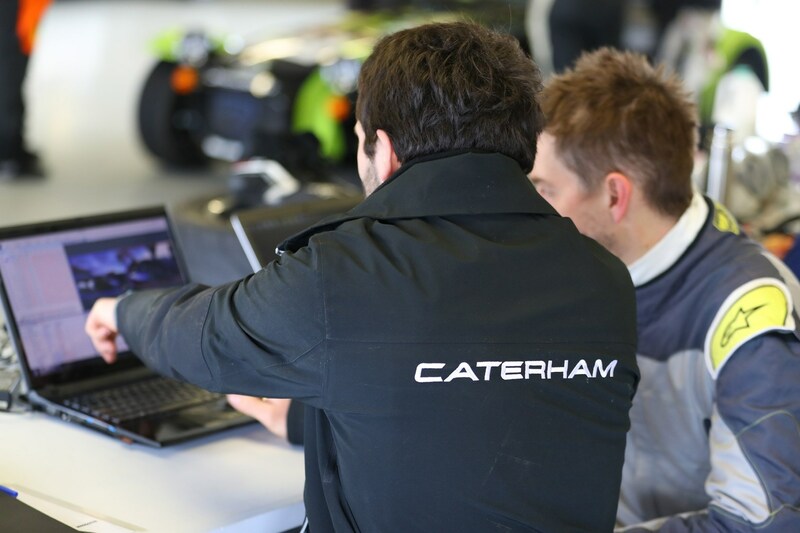 While £27k isn’t a trifling amount of money, the Caterham Academy (caterhamcars.com/en/motorsport/academy) will see you to full racing driver status, with everything you need – licence included – bar your racing kit. What’s more the car’s yours to keep at the end of the season, to race or to enjoy on the road, and the immutable laws of supply and demand mean it’ll always be worth about £21k, regardless of how mercilessly you thrashed it. I did the Academy in 2017, and emerged with a handful of finishes lodged firmly in the midfield, with a best of 8th. 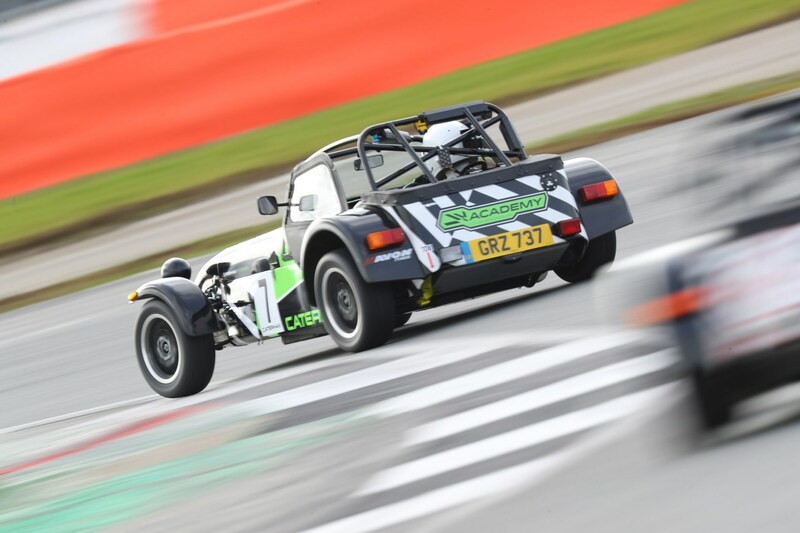 And when, for this weekend in March, Caterham decided to replace its traditional pre-season test with a team endurance event, the chance to get back out on track fell into my lap. 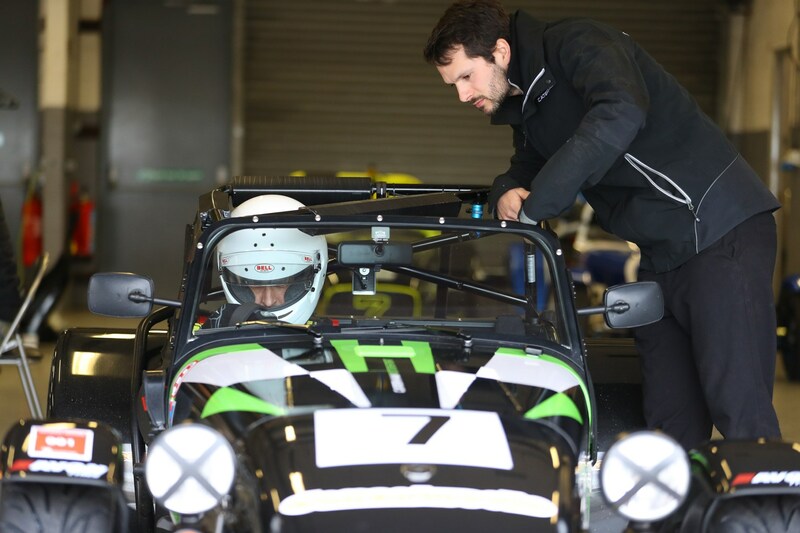 My team-mates would be Caterham CEO Graham McDonald, a fellow 2017 Academy graduate in his 270R, and chief commercial officer Dave Ridley, a handy driver in the 310R class. 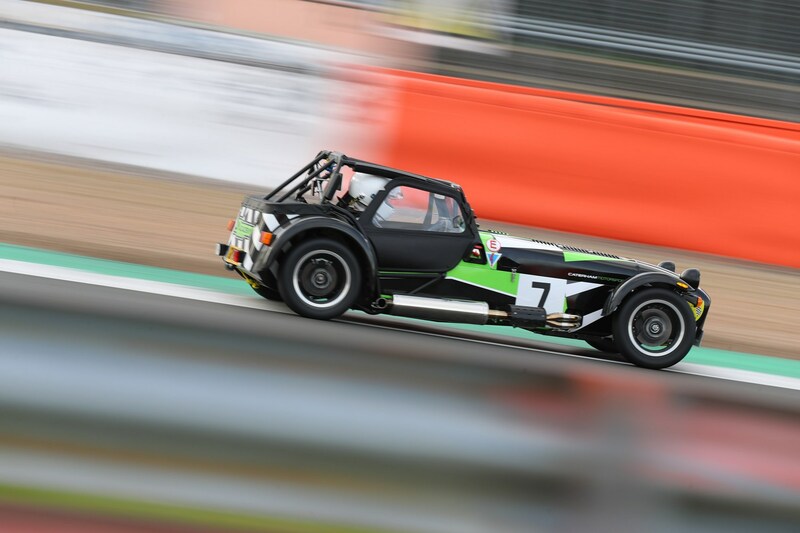 For reference, Caterham’s ladder runs from bum-basic Academy through Roadsport – ostensibly the same car with better tyres – to 270R, 310R and then 420R, and all but the 420R series can be contested with modifications to your original Academy steed. 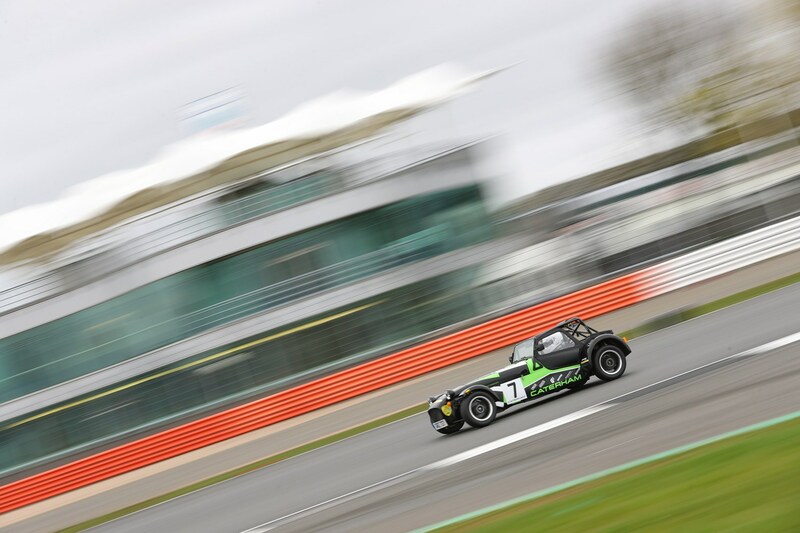 The Silverstone four-hour enduro was open to teams of three drivers balanced across the three classes, with recent results helping create a points value for each driver based on his speed. Graham and Dave are good, so their third driver needed to be less good and preferably a bit rusty – bingo; I got the call. To shake off some of that rust, I head to Silverstone for an official BRSCC test day the day before the race. 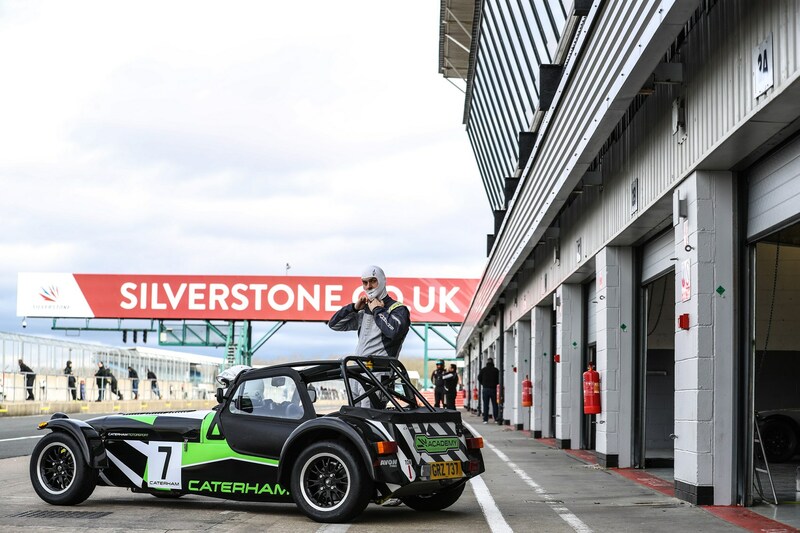 While the pitlane is an eclectic joy, reverberating to everything from a Porsche Supercup racer through Radicals to a Rover SD1 and Jaguar E-Type, my group is 100% Caterham. Helping bring me up to speed is Caterham tech and tactical genius Joe Marsh who, together with wrenchman Craig Standivan, does everything he can to make me feel like an F1 driver: lap time and racing line analysis via telemetry and video, set-up discussions regarding the variables on the car (broadly limited to tyre pressures, fuel load and front and rear anti-roll bar settings) and standing coolly in the pitlane to beckon me from the pit garage when it’s clear to do so. Just like on TV. Usefully, the weather is all over the show: wet and slidey in the morning, turning to warm, dry and fast in the afternoon. The moist start is a perfect classroom for a re-introduction to racing Caterhams, bringing down speeds and forcing me instead to focus on technique and building my feel for the car. With Joe’s help we try different set-up combinations, aiming to create a versatile car that’d handle anything the weather can throw at it come the race. 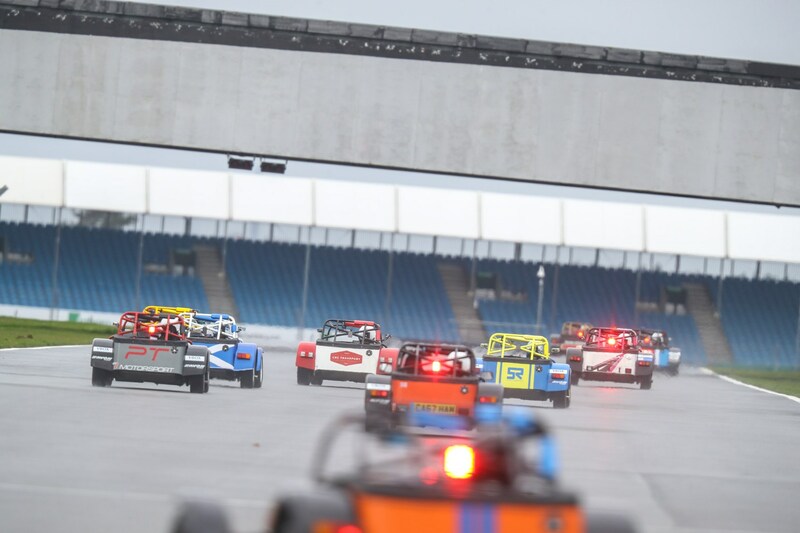 Silverstone’s National layout is no Spa but driving a car as hard as you can anywhere, and really thinking about what you’re doing, is always all-consuming. And we chip away at my pace, my initial best of a 1:11.3 dropping through the 1:10s to a best of 1:09.9 in the afternoon, with a tweak for more toe-out after lunch to help the car into corners and get a little more front tyre temperature. As Fridays go it’s a standout corker. Qualifying from the first F1 race weekend of the year is on the radio as, early on Saturday morning, I blast back to Silverstone in my long-term test 850i, the mighty BMW’s all-wheel drive laughing at the drizzle where the analogue, rear-drive Caterham will try all day to pirouette. My neck’s sore from yesterday. Then the commentator describes Lewis Hamilton’s outrageous speed and commitment through Albert Park’s first two corners, and I decide to stop whinging. Saturday morning, qualifying, and we’re walking on air. Given Dave’s in our fastest car, it’s his time that matters: and it’s good; really good. Second-on-the-grid good. He’s jubilant, and so are Graham and I. This lasts about an hour, until we’re told our transponder was faulty and we’ll actually start 21 of 22 runners, not for any lack of speed from Dave but because his transponder failed to log a time. We’re gutted – for as long as it takes to realise there’s still a four-hour endurance race to get ridiculously excited about. The four hours of the race itself pass like a low-flying jet; quickly and spectacularly. We each drive three stints each. There’s a 30-minute limit on stint length, fully twice as long as each Academy race i drove in 2017. 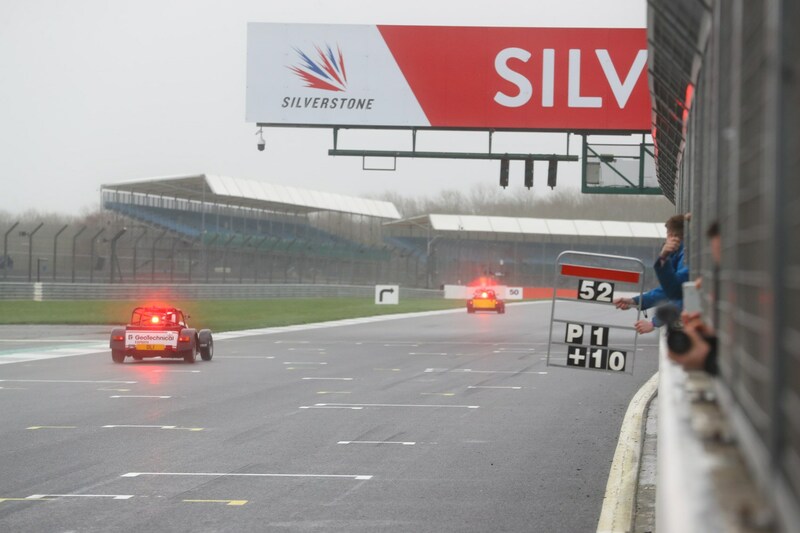 A wild Silverstone wind brings in all sorts of weather, much of it at once. And on track, each time you’re out, the challenge is utterly absorbing: driving as quickly as you can without risking contact or a spin, and without holding up or tripping over any of the faster cars lapping at the same time. My first session’s scrappier than a missionary’s bible, my flow hobbled by a skewed talent-to-ambition ratio and a 10-second stop/go penalty, which I curse myself for over the rest of the session, thinking I earned it speeding in the pitlane, only to find team-mate Graham earned it drifting wide and beyond track limits on the exit of the first corner, Copse, which is quick – the top of fourth gear – but never quite as quick as you wish it was. As Joe patiently explains though, it proves the key differentiator on my fastest laps, with every additional mph hoarded on exit an accumulating advantage all the way down to Maggotts. Our progress is inexorable. We’re soon running in the mid-teens, then the top 10. By the time my last session rolls around, we’re inside that top 10. It’s raining properly now but I’m happy like a duck in a downpour, skating around on wet lines, the Caterham telegraphing grip and slip so clearly you’d have to entirely numb to spin it, and my glee building with every rival passed or last seen skating off into the gravel. And then I’m done. The relief is total and euphoric - a euphoria that lasts well past the chequered flag as Graham, flying on a short, sharp 24-lap final stint in his 270R running a full wet set-up, sees us up to seventh overall and fifth in class. And so it begins again: calculating finance, comparing loans, working out what in my life of any value can be sold immediately, no reserve. Thinking you’ve left it too late to start racing? No chance. One of my Roadsport rivals, Trevor Conway, turns out to be in his 60s. He just did what you probably should – and signed up.